What is the aging family? Emily Saltz, a noted geriatric care manager and aging family expert, says that no two families are alike. Every family is its own complex, unique, constantly changing system of important relationships, including the strongest dyad, siblings. Each connection in the clan, at one time or another, must deal with life’s most important events and issues: birth and death, marriage and divorce, intimacy and distance, growing up and aging. It can be overwhelming and even destructive for the dysfunctional family. What is that? The dysfunctional family that is marked by strained relationships and unresolved conflict. 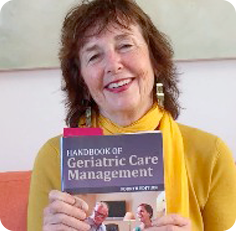 Saltz tells you how to look for signs of the dysfunctional family in her chapter on working with the aging family in the third edition of my book Handbook of Geriatric Care Management http://www.cathycress.com/books/geriatric-care-management Jones and Bartlett, 3rd edition. Do you have an aging dysfunctional family where the midlife siblings need to have a family meeting? That family meeting might be about care of an older parent, an aging Mom or Dad crisis, dividing up the family home after Mom moves or dies or any of the many elder life transition that happen to midlife siblings. What’s an aging dysfunctional family? Well they are very much like a war zone. Clans remain at war with each other, like the 1980’s Serbian conflict or the Iraq war pitting the Sunni’s against the Shia.These tribal battles have gone on for centuries and have the same bloody roots of the dysfunctional family -repeated from one generation to the next. The hallmarks of the dysfunctional aging family are, after decades as a sibling clan there is still not enough love in the family. The now midlife siblings have to fight for what little nurturance their older parents can bring to the ancient rickety nest they built. These aging dysfunctional families generally negotiated all of life’s developmental phases with great difficulty. The role in the family, especially the parental one, was murky with a poor, abusive or mentally unfit leader of the family. The rules in the family were unfair ambiguous or full of double binds. There is deep-seated ambivalence. Finally the last life transition in the aging family, the care of the declining parent, implodes the family, which had little balance to begin with. They are asked to care for parents who did not care for them, thus reeking havoc on an already disorganized aging family. So if you are planning on having a family meeting with siblings from a dysfunctional family, you need a skilled mediator with at least 100 hours of mediation training. I will soon be out with an e book on my web site on How To Have A Family Meeting. It will include these tough difficult dysfunctional families. Check out my www.cathycress.com web site to find it soon. Sibling Family Meeting- Are you a Nearly Normal Family? What type of sibling/ family needs a mediator to run a family meeting? Exactly what type of sibling/ family needs a facilitator to manage their family meeting? Siblings in a dysfunctional family which need a mediator to run a family meeting. Sibling in a “ nearly normal’ family ( see photo above) need a facilitator. If you have sibling family problems and want to have a family meeting, let’s look a nearly normal family and see if you fit in this category, when you hold a family meeting. This type of family is generally compatible, cohesive, productive, and stable. “Nearly Normal Aging Families” are usually close-knit, well integrated, high functioning, and sufficiently resilient. With the help of a facilitator, these sibling family members can communicate well enough to help make wise decisions about complex family/sibling problems. Nearly normal families accept differences of opinion as inevitable, realizing that settling family disagreements is not only an ordinary part of decision-making, but also an opportunity to expand their individual thinking, which enables them to make better-informed decisions. They “lock arms” to address the problems they encounter and have, in fact, locked arms to solve problems all of their lives. What is a facilitator- the professional who should run the family meeting for a nearly normal family? A facilitator is a person who accepts the responsibility to help the “ nearly normal “ siblings address the problems that prompted the family meeting. He or she can develop the agenda and guide siblings as they talk about options and strategies to solve the difficulty at hand. She or he can help participants stick to the agenda so decisions and plans for solving problems are made within the time available. The facilitator does not make the decisions. Rather, she or he helps the siblings state their opinions, ensure that all are heard, and move forward toward decisions that are acceptable by all. Good choices for facilitators are social workers or Licensed Clinical Social Worker LCSW ‘s from local agencies, professional geriatric care managers (GCM’s), marriage and family therapists, (MFT’s) physicians, and members of the clergy or trained psychologists. Tomorrow I will cover a dysfunctional sibling family and a mediator, who is the professional who should run a sibling family meeting for a very difficult or dysfunctional family. Very soon, on my website, my new book Sibling Family Meetings will be available. Keep checking. What is a Sibling ? What is a sibling? You can find out in my fast flash sibling video. It is and they are much more than you think. It’s legal, social and blood. Watch the video by clicking the link. Have you ever had elderly aunt, uncles, and your own parents, who are estranged from their own older siblings? There is a way you can help them reconcile – that is a estranged elder family meeting. 3. Elderly sisters or sisters of any age have the greatest degree of closeness, support, acceptance and contact of any sibling dyad. They have the least envy and resentment. Reconciling aging sisters can be the best resolution in an older siblings life. So if you have elderly family members who have cut each other off, don’t talk, are mad about something 50 years ago, schedule a family meeting to bring the deepest, longest most meaningful relationship- their sibling, back in their life.